On a summer’s day in 1937 in the gardens of his Florentine villa, Bernard Berenson, the renowned art critic and collector, is casually discussing art and world affairs with his wife Mary and his mistress Nicky. Unbeknownst to Berenson, at a nearby hotel, multi-millionaire Joseph Duveen is preparing to bring him a priceless painting to examine – though Duveen knows this may shatter their 30-year, and highly secret, business arrangement. 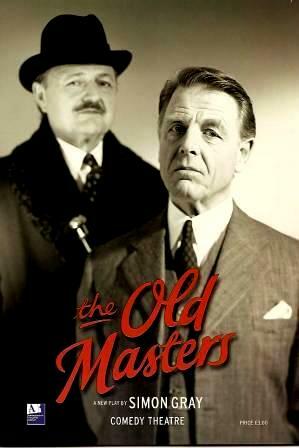 The Old Masters premiered at the Birmingham Repertory Theatre on 4th June 2004. It had a short season, 4 – 19 June, before transferring to the Comedy Theatre, London, on 1 July 2004 (previews from 26 June). Its initial run until 28 August was later extended until 13 November, then again until 18 December, 2004. Space dictates that we have only included photos featuring Steven Pacey. Only one tiny photograph is available, from Harold Pinter’s Website. “There’s excellent support, too, from … Steven Pacey as Duveen’s emissary. Other reviews published at the time (eg The Guardian and The Times) are no longer available online. Please note: The term The Old Masters as well as all associated graphics, logos, and/or other tradermarks, tradenames or copyrights are the property of Simon Gray, Greg Ripley-Duggan with Duveen Productions and Ted Tulchin in a Birmingham Repertory Theatre Production, and the Comedy Theatre and are used herein for factual descriptive purposes only. We are in no way associated with or authorized by the owners and neither that entity nor any of its affiliates have licensed or endorsed us to sell tickets, goods and or services in conjunction with their events.